This roasted brussels sprout salad with bacon recipe is the perfect fall holiday side dish. 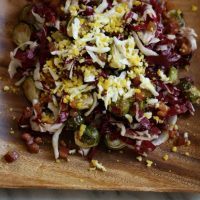 The egg mimosa and salty vinaigrette is a great addition to the bitter radicchio and caramelized sprouts. On a parchment-lined baking sheet, toss the Brussels sprouts with the olive oil until well coated. Arrange cut-side down and season with salt. Bake in the oven until browned and caramelized, 30 minutes. Meanwhile, place the eggs in a small saucepan and cover with cold water by 1 inch. Bring to a boil. Remove the eggs from the heat and allow to sit in the water until cool enough to touch. Peel the eggs and press them through a coarse-mesh sieve into a bowl. Set aside. In a small skillet, cook the bacon over medium-high heat until nicely browned and crispy. Remove from the heat. In a medium mixing bowl, whisk together the Dijon and vinegar. Add the bacon fat, a few drops at a time, and whisk until smooth. Fold in the remaining bacon and fat. Arrange the radicchio and Brussels sprouts on a serving platter. Drizzle with the bacon vinaigrette and top with the egg mimosa. Serve immediately.